With their cab-forward styling, Chrysler’s LH cars have earned the automaker a reputation for cutting-edge design. LH is an industry insider term referring to a trio of midsize sedans that made their debut in 1992, a time when Chrysler was just beginning one of the most striking turnarounds in automotive history. And these mid-size sedans played a major role in that turnaround. 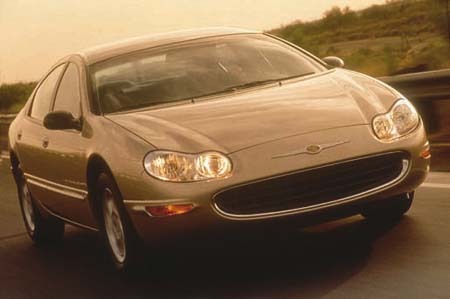 Now, five years later, Chrysler has completely redesigned its two most popular LH cars, the Chrysler Concorde and the Dodge Intrepid. The third model in the original line-up, the Eagle Vision, is vanishing from the fold as the entire Eagle division is shut down. The Chrysler Concorde is visually the most striking and, like the 1992 original, the updated Concorde uses cab-forward design to maximum advantage. It noses into view with a grille reminiscent of old Aston Martins and Ferraris. The sloping cowl sweeps into a steeply raked windshield. The visual impression is one of kinetic motion. The ’98 Concorde has plenty to live up to, but also some things to live down. There were early quality problems with the original Concorde. And the first cars were not as refined as they could have been in terms of noise, vibration and harshness, or NVH. So a critical question, as we went to test one of the first of the ’98 models was just how much of an improvement we would see under that beautiful skin. The word, sculpture comes to mind in describing the new Concorde. The body features a bare minimum of snap-on cladding. Instead, there is great nuance to the sheet metal, which rolls and undulates like a work of art. The massive, oversized grille is Jaguar-esque. Above it sits the Chrysler division’s retro-looking winged emblem. Large, kidney-shaped headlights are jewel-like in appearance, but show that not only can form follow function, but function can follow form. One of the most frequently heard complaints about the first-generation LH cars was their lack of adequate lighting. Concorde’s new quad beams provide brilliant illumination as well as a classy styling touch. Except for the high-end LHS, the original LH sedans were cookie-cutter designs distinguished only by grilles, headlight shapes and other details. One of the top priorities with the new models was to give each car its own identity. To start with, the new cars share almost no sheet metal. And while all the cars ride on a 113-inch wheelbase, the Concorde’s body shell is longer, translating into significantly more rear leg room. There’s also a cavernous 18.7 cubic feet of trunk space, up from 16.6 cubic feet with last year’s model. But the numbers don’t tell the whole story. There are many small improvements. In the original Concorde, the trunk’s gooseneck hinge swung into the cargo compartment, crushing anything in its way. Trunk hinges on the new models fold cleanly out of the way. Chrysler designers haven’t ignored the interiors of their new sedans. The quality of the materials used has been substantially upgraded. Colors match well, and gaps have been minimized. Nowhere is that more obvious than in the space where doors and dashboard come together. On the old cars, this used to be a yawning chasm; now it’s a tight fit. The Concorde comes standard with front bucket seats, though a six-passenger model with a front bench is available. The buckets have been improved in the new model. They provide better back and lateral support and the detailing of the fabric is world class. An optional leather package is available. For those who believe big is better, it’s hard to find anything to compete with the Concorde. The cab-forward concept efficiently packs the engine into a tight space to maximize passenger space. In this case, you’re getting nearly a full-size interior on a midsize wheelbase. This adds an extra 2.8 inches of rear legroom to the Concorde. There are plenty of features to recommend the Concorde, and one of the nicer touches is the overhead console featuring a compass, outside temperature gauge and map lights. There is no center-seat shoulder belt for the rear seat. Another surprise is Chrysler’s decision to do away with the optional integrated child safety seat. Apparently there just weren’t enough takers. If there’s a downside to the Concorde’s sleek cab forward styling it’s the fact that visibility is slightly reduced. The front windshield is steeply raked. It takes some time to get the feel of the front end to know precisely where the front edges of the car are, which cannot be seen from the front seats. It takes a bit of getting used to the view out of the small rear window, too. Often, it’s what you don’t see that matters most to the driving experience. While the new Concorde shares the same basic body architecture of the original sedan, a number of critical changes improve torsional rigidity and reduce bending. One such change is a new aluminum cross-beam mounted behind the instrument panel that decreases body shake, noise, vibration and harshness; it also improves the car’s handling and reduces body roll in corners. Impressively, the ’98 Concorde is no heavier than the previous model, a benefit of its liberal use of strong, lightweight aluminum. Lifting the hood reveals more improvements for ’98. The Concorde LX comes with a 200-horsepower double overhead-camshaft 2.7-liter V6. With the upscale LXi, you get the 225-horsepower single overhead-cam 3.2-liter V6. Both of these all-aluminum engines are new for ’98. Chrysler spent nearly $700 million to develop these and a third engine, a 3.5-liter V6, which will be used in the sporty Chrysler 300M. The 2.7-liter engine used in the LX was a marked improvement over the engine used in last year’s model. It’s quieter and more powerful than the 3.3-liter overhead-valve cast-iron V-6, which churned out 161 horsepower. Under hard acceleration, the old engine sounded like it was thrashing and running out of breath. And the new engine is more fuel efficient, getting about 1 mpg more on the highway. Those who want maximum off-the-line acceleration should opt for the LXi with its more powerful 3.2-liter engine. One feature the Dodge Intrepid offers that’s not available with the Chrysler Concorde is the optional AutoStick transmission. At its heart, it’s the same electronic 4-speed automatic, but the AutoStick allows the driver to manually shift, providing entertainment and improved shifting efficiency. The suspensions are essentially the same on both the Concorde and the Intrepid. Standard Intrepid and Concorde LX models come with 15-inch steel wheels and Goodyear Conquest GA tires. Intrepid ES and Concorde LXi models have 16-inch alloy wheels with Goodyear Eagle GA tires. The bigger tires have notably more grip, particularly in hard cornering and braking maneuvers and, surprisingly, they are quieter. There were plenty of “oohs” and “aahs” when they first unveiled the new Chrysler Concorde and we think it will turn heads wherever it goes. But beauty is more than skin deep on these cars. Two new engines and a stiffer body structure have resulted in a car that is quieter and smoother than the vehicle it replaces. It’s a world-class sedan. Add increased space for passengers and cargo and you come up with a winning combination. That still leaves the question that has been hanging over Chrysler: can it deliver the type of quality today’s buyers expect? The automaker insists it has double and triple-checked every detail. A sophisticated new computer design and engineering system was put into place to identify and resolve potential problems long before the first Concorde went into production. If these new processes work only half as well as Chrysler promises, then buyers of these exciting new sedans will be driving world-class cars for years to come.